Imagine having 60,000 additional staff members to help you research, analyze, solve problems and improve a process. Being a member of the American Water Works Association brings you all of this and more! Membership benefits everyone from operators to regulators, manufacturers to consumers, and utility managers to students. Whatever the job, you need timely, accurate information to get things done. 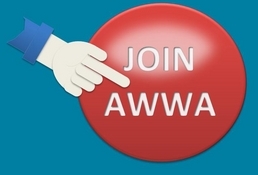 Join AWWA today and get what you need to succeed! People are the power of any organization. AWWA brings together the largest pool of experts in the water profession, providing members the opportunity to share on-the-job experiences, discuss local and national issues, work together to improve processes, discover new clients, and open the door to new job possibilities. Staying up-to-date on changes affecting the water community is more important now than ever before. AWWA is a comprehensive resource, providing up-to-the-minute information on everything from the latest security issues to regulatory alerts to public affairs advisories. AWWA's website, bookstore, and technical databases keep you on top of scientific research, legislative activity, new products, and late breaking news. Training is the best investment you can make in yourself and your career. By advancing your skills, you improve your performance, and your value to your employers. AWWA's educational opportunities include seminars, satellite teleconferences, and web-based courses through our Online Institute. Training is available on everything from distribution systems to financial management to water utility security measures. AWWA offers both certification and re-certification training courses, and most provide the opportunity to ear your Continuing Education Units (CEUs) and/or Professional Development Hours (PDHs). AWWA's Government Affairs program is the best resources when it comes to keeping you up-to-date on legislative and regulatory changes, helping you with compliance issues and putting you in touch with key contacts at the local, state, and federal levels. As a member, you are part of a collective voice that helps shape the development of legislation and regulations that affect the water profession. In addition, AWWA can help you reach out to your consumers and build relationships with the community. Build professional recognition by being part of the largest, most respected association in the water industry. Volunteer service on any of AWWA's committees, divisions or councils can provide you with new insights, new contacts, and new energy. AWWA involvement will get you noticed.